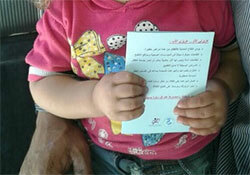 After receiving polio immunization, a Syrian child shows her vaccination certificate. The campaign, serving an area where conflict has disrupted regular medical services and immunization, used the inactivated polio vaccine (IPV). Given by injection, the IPV provides protection against all 3 strains of the disease: types 1, 2 and 3. Since the start of the conflict in 2011, WHO and other health partners have carried out vaccination campaigns to stem the spread of infectious diseases such as polio. However, ongoing unrest has prevented programmes from operating on a regular basis. Since March 2017, more than 45 children in north-eastern Syria with symptoms of paralysis were diagnosed, and then laboratory-confirmed, with a vaccine-derived form of type 2 polio. This form of polio can emerge on rare occasions when immunization coverage is low. In June 2017, WHO declared a polio outbreak in the eastern part of Syria. With conflict causing many families to flee from other areas of Syria to the north-west, health experts worried that polio could spread to the north-western area as well. To address these challenges, in summer 2017 WHO/Europe and the United Nations Children’s Fund (UNICEF) procured large quantities of the IPV. WHO/Europe’s field office in Gaziantep, Turkey, and its partner the Syria Immunization Group (SIG) drew up a plan to use the IPV to protect hundreds of thousands of children against all forms of polio. Preparations for the campaign, implemented by SIG, involved extensive social mobilization in September 2017. Announcements from loudspeakers, mosques, portable 2-way radio systems, and via mobile phone messages reached huge numbers of Syrians. Posters, banners and cards inserted in packages of bakery bread alerted parents about where and when to bring their children to be vaccinated. The IPV campaign started in areas of north-western Syria such as Idleb and western Aleppo in late September. Children between 2 and 23 months of age were vaccinated at fixed sites including schools, mosques and local council buildings. The operational costs of the IPV campaign were kindly funded by the Department for International Development (DFID) of the United Kingdom.